Connect your computer to your Cisco router, server, or network equipment. This 6ft Cisco Console Cable/Rollover cable is a cost-effective replacement cable which enables you to connect your computer to your Cisco router, server, or network equipment. This durable Cisco Console Cable is a direct replacement cable that conforms to the Yost Serial Device Wiring Standard.Expertly designed and constructed of only the highest quality materials, the Cisco Console Rollover cable delivers maximum dependability. 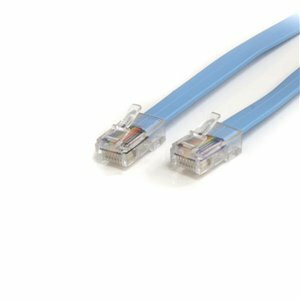 This 6ft Cisco Console Cable/Rollover cable is a cost-effective replacement cable which enables you to connect your computer to your Cisco® router, server, or network equipment. This durable Cisco Console Cable is a direct replacement cable that conforms to the Yost Serial Device Wiring Standard. Expertly designed and constructed of only the highest quality materials, our Cisco Console Rollover cable delivers maximum dependability and is backed by our Lifetime Warranty.